As most of us regard “relaxing” as an activity done when we are not working (either in a formal, wage-earning way or in the unpaid capacity or running a household), it got me thinking about working. We ask children, “What do you want to be when you grow up?” This is confounding as the inquiry can give us humans–in our childhood forms–the idea that once you stop growing, you’re pretty much stuck with what you choose to do because you’re out of time, i.e., you’re done growing. What a disservice. Moreover, what a telling question it is when considering the perspective of the enquirer. The simple act of posing such a query speaks volumes about how the already-grown-up person sees adulthood and the inevitable end of childhood. It’s almost as if to assert: you’re born, you achieve consciousness, you are asked to think a decade and a half down the road and make a statement of future vocation. Imagine, if you can, being five again and Grandpa crouches down to find out what you want to be when you “grow up.” By age five, thanks to your consciousness and the cultural focus on vocation/career/job/money/materialism, you actually have formed a thought (unrealistic as it might be) on what your life is going to look like in fifteen years. This is about as reasonable (by way of ratios) ask asking a 20 year old what life is going to look like when that person becomes an octogenarian, which I would assert is completely unreasonable. Nevertheless, we keep asking and kids keep answering. What I find so fascinating about this ubiquitous exchange between the generations is the topic, i.e., work. Grandpa does not ask, “What sort of skills would you like to have when you learn that a loved one is dying?” or “How do you wish to cultivate your interpersonal skills so that you can be well regarded in your community?” In many ways, the simple and, now you may be thinking, myopic question about future career can easily establish, in a young and impressionable mind, the notion that being “grown up” requires work. A lot of it and to the exclusion of most other things. I read, I write, I nap, I take saunas, I practice yoga, I walk in the woods with my dogs. Even when I’m cooking, cleaning, laundering, and the like, I’m not doing it with any degree of anxiety or stress. While domestic tasks do need to get done, there are days that they don’t and–as of yet–there hasn’t been a fatality from a lack of clean underwear or a concern over malnutrition for a just-look-in-the fridge-and-find-something-to-eat weekend lunch. Finding the time to luxuriate in leisure leads the heart to calm. A calm mind can encounter nearly any of life’s challenges with a sense of equanimity. And Google has a point, even if it took until Row 17 to make it. Many believe that limited and thoughtful use of marijuana can have both relaxing and introspective benefits. Just the other night at the dinner table when our family happened to come upon a conversation about marijuana, I made the point that there is no such thing as “medical alcohol” or “medical nicotine.” This plant, easily grown organically, has naturally occurring properties that treat problems (both mental and physical) as opposed to the pharmaceuticals which are composed from chemicals in a laboratory. My simple Google search for the word “relaxed,” has led me to the confident conclusion that “work” is not something we should be asking children about. Additionally, once grown, we might consider talking to one another about anything but work. Ask about the last trip to a museum. Ask about a favorite line of poetry. Ask about a hobby. Ask what was consumed for breakfast. And please, the next time you see a five year old, think over the merits of vocational assessment. 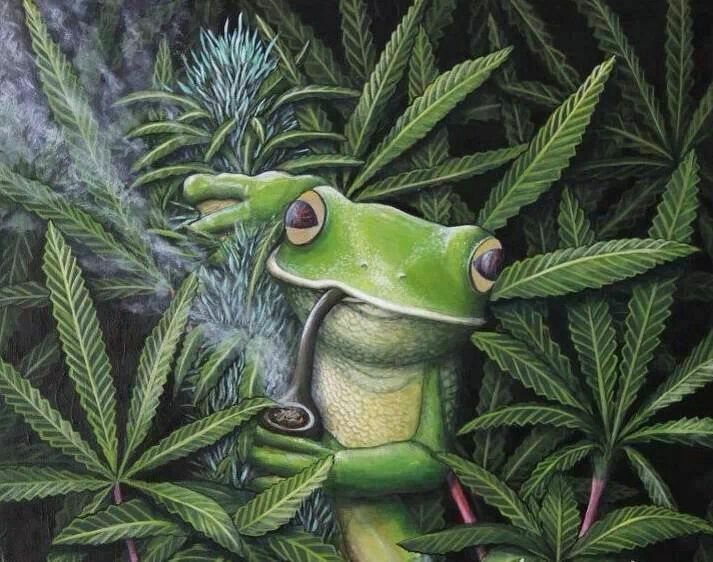 Instead picture a frog in savasna taking a bong hit. The best Google could do when I searched for THAT image. I once read that Boulder, CO and Baraboo, WI are two towns that when people are asked what they do, the responses are in terms of activity and leisure activities instead of their occupation or monetary work. I’ve often further wondered if this might produce people who are more content or what difference this makes in overall well-being. It seems like a more holistic way of living and discovering how others live. Ok, in baseball 1 hit in 3 at bats is a good thing. Everybody needs a good hit. Agreed. Too many young people feel like they have to have their lives figured out by the time they’re 20. My niece and stepdaughter are going through this (24 and 21), and they’re stressing out about it. It hurts me to see them go through this. I tell them they’re going to go through many phases, experiments and false starts before they find what they’re looking for. Anyway, love the frog, my husband would appreciate that! I got asked this question deep into my 20’s. Always a breath-away-taker, I replied: “I want to live by the sea.” There it is, less than 2 km away. I thank myself for being so proactive. I think you may be closer with sandals on your feet.